Transit options include trains, buses, cars, and hot air balloons. When traveling around Spain on your European vacation, there are a number of options including service by train, bus, and rental car to get you between destinations, especially when trying to get from the capital city of Madrid to other smaller cities like the historic Castilian city of Segovia. Located just 90 kilometers northwest of Madrid, Segovia is a popular tourist destination from the capital city, rich in cultural heritage, attractions, and events. The fastest and most popular way to access this city is via the cheap and efficient AVE high-speed train, but you can also rent a car, take a bus, or even book a guided tour to get you to your destination. 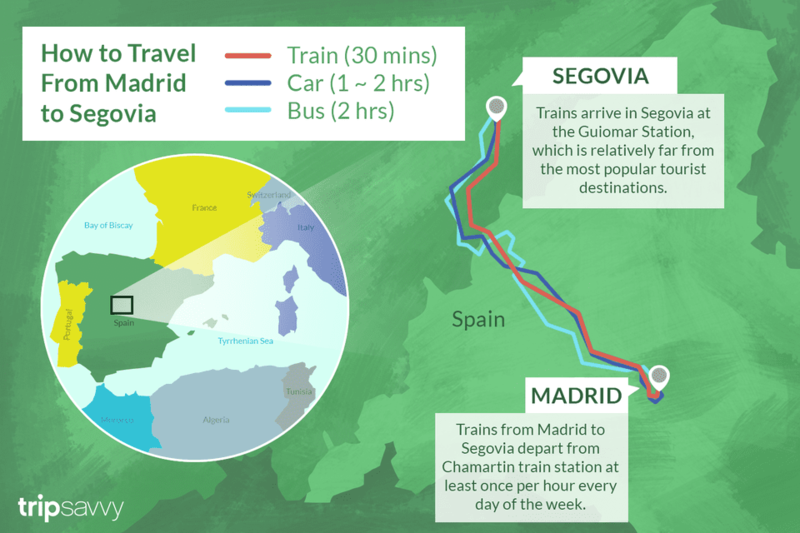 AVE train travel takes about 30 minutes to cover the 90 kilometers between Madrid and Segovia while driving can take anywhere between one and two hours to complete—and even longer if you're taking a bus. Still, each of these types of public transit provides its own set of benefits and disadvantages, so make sure you're choosing the right service to suit your needs before you book your trip. There is an AVE high-speed train from Madrid to Segovia which takes about half an hour and costs about 12 euros, though a few tickets cost more for no apparent reason despite the trip taking about the same amount of time. Trains from Madrid to Segovia depart from Chamartin train station at least once per hour every day of the week and arrive in Segovia at the Guiomar Station, which is relatively far from the most popular tourist destinations. To ensure you're getting the best deal on your purchase, be sure to book your train ticket at least two months in advance as prices begin to climb closer to departure dates. Especially given this has now become the most popular means of travel between Madrid and Segovia, you'll want to make sure you don't pay a premium just because you waited to purchase your tickets. Although the website that sells bus tickets for most of Spain used to have a bad reputation for being error-prone and full of bugs, La Supulvedana updated its user interface to be much easier and quicker to navigate. Also, while bus services used to be the same price as train services, bus fare is now cheaper, making a bus trip to Segovia a viable option if you don't mind spending an extra 30 minutes to an hour in transit. Buses also provide the opportunity to break up your trip and experience some smaller cities, especially if you're booking a guided tour. One such tour, which stops in Avila, a city whose UNESCO-protected walls are the most impressive in Spain, is an excellent way to see Segovia and get the most out of your travel time. Tours such as these are usually cheaper than you'd expect, and you can get a full list of tours offered by visiting Viator's "Guided Tours of Avila and Segovia." There are also some excellent vineyards close to Segovia who accept tours of bus travelers from Madrid. If you're a fan of fine dining, wine, and unique experiences, be sure to check out a wine tour like the Segovia Wine Tour from Madrid, which includes a cultural tour of Segovia as well as a three-course meal (with wine) and a VIP visit to a winery. When it comes to driving yourself—or using one of the popular rideshare apps like BlaBlaCar—the 90-kilometer journey from Madrid to Segovia takes about one hour if you follow the A-6 to the AP-61 toll road into the city, or a little longer if you take the A-6 to the N-603 instead. This route takes you past several smaller cities worth exploring (if you have the time) including Hontoria, Los Angeles de San Rafael, Guadarrama, Alpedrete, Collado Villalba, Toerrelodones, and Las Rozas. Alternatively, you can take the more winding and scenic eastern route of the M-607 to CL-601, which passes through Quitapesares, Real Sitio de San Ildefonso (home of the Palacio Real de La Granja de San Ildefonso), Valsaín, Cerceda, Colmenar Viejo, Navacerrada, and the scenic Parque Regional Cuenca Alta Manzanares. Remember that you may need an international drivers' license to rent and drive a car in Spain, so be sure to check Spain's requirements for car rentals and get this form of identification before you take off on your trip. Also, renting a car is by far the most expensive option, so if you just need to make a quick trip up to Segovia from Madrid, maybe consider a bus or train instead. Although there are no direct flights from Madrid to Segovia, there is one way to travel between the two cities by air: a Segovia hot air balloon ride. Soar over one of Spain's most beautiful cities and get a real perspective on how big famous attractions like the aqueduct and fairytale castle are. With an optional Madrid hotel pick-up, this is a great way to get to Segovia and see the city in a unique fashion. Alternatively, you can ask the tour company to leave you in Segovia when you finish the ride and take a train back to Madrid after your day in the city. For more resources on Madrid and Segovia, try out one of these "100 things to do in Madrid. No matter how you decide to get there, you'll want to plan your Spain trip before you go to ensure you make the most of your time in this European country. Madrid to Barcelona: What's the Best Way to Make the Trip?